SET IN AN ELEVATED LOCATION at the end of a small exclusive close is this delightful detached family home with flexible accommodation including a ground floor bedroom with adjacent shower room. The house has been carefully maintained by the current Vendors to provide a bright modern interior which benefits from sealed unit double glazed windows, oil fired central heating, herringbone woodblock flooring to some rooms, and open fireplace in the lounge. Other improvements include UPVC soffits, fascias and guttering and the addition some years ago of a conservatory. There is a light hallway with understair storage cupboards and cupboard housing the boiler providing domestic hot water and central heating. The property has a lounge, dining room, and conservatory with doors to the garden. The kitchen/breakfast room has a good range of worktops, cupboards and drawers, space and plumbing for dishwasher, in built double oven and hob. 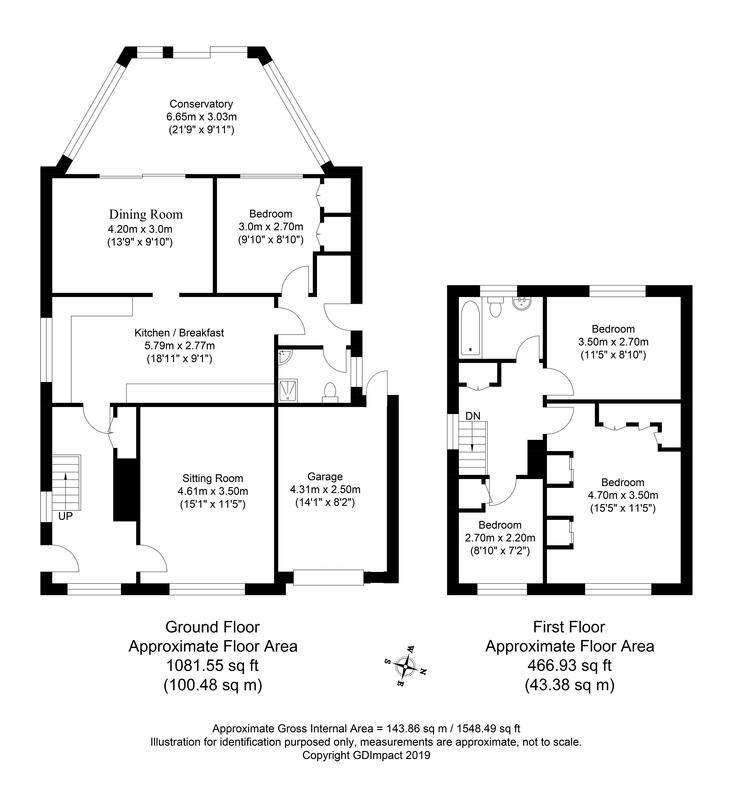 To the rear of the house is a ground floor bedroom/study with an adjacent shower room ideally suitable for a guest/elderly relative. On the first floor the main bedroom has a range of fitted wardrobes. There are two further bedrooms and a bathroom with pleasant outlooks both front and rear. Outside the house has an attached garage with light and power, and parking for two further cars. There is a front garden and side access to the attractively laid out rear garden with fish pool, new pergola and terrace. The whole is well fenced and measures 60ft x 30ft with a pleasant south west facing aspect..
An ideal opportunity to purchase a comfortable and bright family home in a tucked away location with pleasant outlooks towards East Grinstead and over the adjacent village playing fields. Westy Hoathly is a very popular village located between the towns of East Grinstead, Crawley and Haywards Heath all of which provide an excellent range of shops, supermarkets, leisure/sports amenities and rail services to London. The village is also well placed for access to Gatwick Airport/Station, 11.5 miles, and the M23 motorway with its access to the wider motorway network. West Hoathly has a Parish Church, a very popular period Inn, The Cat, and primary school whilst the immediate adjacent village of Sharpthorne has a local store and organic cafe. The larger lively village of Forest Row with its wide range of specislist stores and shops, health centre, cafes/restaurants is only 5.5 mile to the east. Plawhatch and Forest Row also provide organic farm shops. The area is well represented for both state and private schools including a number of primary schools, and the sought after Cumnor House, Worth, Michael Hall Steiner School and Greenfields. Leisure amenities and sports venues are available within a twenty five mile radius including reservoirs at Ardingly and Weirwood for angling and sailing, race courses at Brighton and Lingfield Park, The Ardingly Showground and the Amex Stadium home of Brighton and Hove Albion Premiership football club. Other places of interest locally include the Bluebell Steam Railway at Horsted Keynes which runs through Sharpthorne to East Grinstead, Wakehurst Place and Sheffield Park Gardens, and the National Trusts Standen Park House.